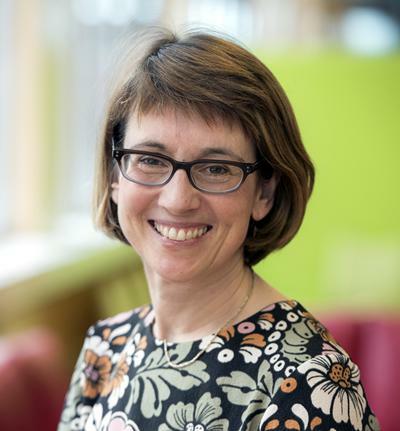 Anneke Lucassen is Professor of Clinical Genetics within Medicine at the University of Southampton and combines key clinical, laboratory and ethico-legal expertise to research developments in genetic medicine and to effect improved delivery of genomic services to individuals and families. What has fascinated me over the last 20 years is combining very different skill sets to approach genomic developments in an interdisciplinary way. The bottleneck for genomic medicine has shifted from cost/ technology limitations to interpretation, and there is much to think about. Her leadership role in national policy development and implementation of best practice is evidenced by appointment to the Human Genetics Commission until 2012; Nuffield Council of Bioethics 2009-2015; Member of HFEA scientific review of treatment of mitochondrial diseases 2011-2014 and Genomics England Ethics Advisory committee 2013 onwards. She was the inaugural chair of the British Society for Genetic Medicine Ethics and Policy committee, and plays a key role in the development, and running of, the Wessex Genome Medicine Centre. In 2013 she was awarded a prestigious visiting professorship to Groningen University, the Netherlands (-2017). The legacy of this is a rolling programme of 4 year joint PhDships between the two universities. In 2017 she was awarded a £1.2 million collaborative research grant from the Wellcome Trust together with Prof Bobbie Farsides at Brighton and Sussex Medical School. This will fund a 5 year programme of research entitled “Facilitating ethical preparedness in genomic medicine” which aims to develop and deliver empirical and conceptual bioethics research as genomic medicine becomes an integral part of healthcare. From 2017 she is Chair of the British Society for Genetic Medicine. An important spinout from the work in this area is the formulation of national policy and best practice guidelines. Examples of national guidelines we have co-authored include: BSHG: genetic testing of children (2010) and for the Joint Committee on genomic Medicine: Consent and confidentiality in genetic practice (Royal College of Physicians 2011, currently being revised). Membership of two different NICE panels (familial hypercholesterolaemia and familial breast cancer) further illustrate this. We are keen to engage with members of the public about our research. We hold regular local events (please see https://www.southampton.ac.uk/cels/ for details) and welcome email contact from interested parties. Daniele, C., Dheensa, S., Doheny, S., Clarke, A., Turnpenny, P., Lucassen, A., & Kelly, S. (Accepted/In press). Recontacting in clinical practice: the views and expectations of patients in the United Kingdom. European Journal of Human Genetics. Lucassen, A., & Lucassen, E. (2011). Letting family members know about genetic conditions; how and when? Bionews, 590. Lucassen, A. (2009). Ethicolegal aspects of genetics in surgical practice. Annals of The Royal College of Surgeons of England, 91(6), 451-455. Rimes, K. A., Salkovskis, P. A., Jones, L., & Lucassen, A. A. (2006). Applying a cognitive-behavioral model of health anxiety in a cancer genetics service. Health Psychology, 25(2), 171-180. Kemp, Z., Carvajal-Carmona, L., Spain, S., Barclay, E., Gorman, M., Martin, L., ... Houlston, R. S. (2006). Evidence for a colorectal cancer susceptibility locus on chromosome 3q21-q24 from a high-density SNP genome-wide linkage scan. Human Molecular Genetics, 15(19), 2903-2910. Oh, K., Khan, S. G., Imoto, K., Jaspers, N., Raams, A., Ueda, T., ... Kraemer, K. H. (2006). Sequential assembly of nucleotide excision repair factors at sites of DNA damage in XP-B cells. Journal of Investigative Dermatology, 126(Supplement 4s), p.78. Lucassen, A., & Houlston, R. S. (1998). Familial colorectal cancer and genetic testic. The Practitioner, 242(1585), 306-314. Lucassen, A., & Houlston, R. S. (1997). Familial breast cancer: who is at risk. The Practitioner, 241, 1581-1581. Lucassen, A. (1997). Genetic screening for breast cancer? Journal of the British Menopause Society, 3(20), 24757-24762. Julier, C., Lucassen, A., Villedieu, P., Delepine, M., Levy-Marchal, C., Danzé, P. M., ... Lathrop, G. M. (1994). Multiple DNA variant association analysis: application to the insulin gene region in type 1 diabetes. The American Journal of Human Genetics, 55(6), 1247-1254. Lucassen, A., Julier, C., Hyer, R. N., Lathrop, M., & Bell, J. I. (1992). Susceptibility to type 1 diabetes mellitus and the insulin locus. American Journal of Human Genetics, 51(4), 193-194. Ashcroft, R., Lucassen, A., Parker, M., & Widdershoven, G. (Eds.) (2005). Case analysis in clinical ethics. Cambridge, GB: Cambridge University Press. Rose, P., & Lucassen, A. (1999). Practical genetics for primary care. Oxford, GB: Oxford University Press. Lucassen, A., Montgomery, J., & Parker, M. (2017). Chapter 16. Ethics and the social contract for genomics in the NHS. In Annual Report of the Chief Medical Officer 2016 Department of Health. Lucassen, A., & Fenwick, A. (2017). Ethical issues in precision oncology/cancer genetics. In E. R. Copson, P. Hall, R. E. Board, G. Cook, & P. Selby (Eds. ), Problem Solving Through Precision Oncology (pp. 81-84). Oxford, GB: Clinical Publishing. Lucassen, A. (2009). Ethical issues in cancer genetics. In S. Clark (Ed. ), A guide to Cancer Genetics in Clinical Practice Telford, United Kingdom: TFM. Turner, C. L. S., Temple, K., & Lucassen, A. (2005). Genetics. In A. Peebles, G. J. Connett, J. Maddison, & J. Gavin (Eds. ), Cystic Fibrosis Care: a Practical Guide (pp. 25-36). London, GB: Churchill Livingstone. Lucassen, A. (2005). Response to ethical dissections of the case. In R. Ashcroft, A. Lucassen, M. Parker, M. Verkerk, & G. Widdershoven (Eds. ), Case Analysis in Clinical Ethics (pp. 213-224). Cambridge, GB: Cambridge University Press. Lucassen, A., & Watson, E. (2003). Familial cancers and women’s health. In D. Waller, & A. McPherson (Eds. ), Women's Health (pp. 489-518). Oxford, GB: Oxford University Press. Austoker, J., Clarke, J., & Lucassen, A. (1997). Breast cancer and benign breast disease. In A. McPherson, & D. Waller (Eds. ), Women’s health (Oxford General Practice). Oxford, GB: Oxford University Press. Bennett, S. T., & Lucassen, A. (1996). Identification of insulin gene minisatellites alleles. In J. F. Burke (Ed. ), PCR: Essential techniques (pp. 32-33). Oxford, GB: John Wiley and Sons. Lucassen, A., & Bell, J. (1995). Genetics of insulin dependent diabetes. In R. D. G. Leslie, & D. C. Robbins (Eds. ), Diabetes: Clinical Science in Practice (pp. 117-133). Cambridge, GB: Cambridge University Press. Together with Dr Angela Fenwick (Associate Professor in medical education and ethics) she has developed the curriculum to ensure the law and ethics is integrated appropriately throughout BM programmes; providing teaching; coordinating teachers who teach for the theme and assessing the students’ learning.